Not to be confused with the Montreal Biodome. The Montreal Biosphere is a science museum in Montreal, Quebec, Canada dedicated to water and the environment. 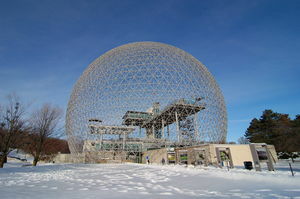 The museum is housed inside a geodesic dome designed by Buckminster Fuller as the U.S. Pavilion at the Expo 67 world's fair. The Montreal Biosphere is situated on Saint Helen's Island. The building originally formed an enclosed structure of steel and acrylic cells, 76 metres (250 feet) in diameter and 62 metres (200 feet) high. A complex system of shades was used to control the internal temperature. Visitors had access to four theme platforms divided into seven levels. The building included a 37-metre long escalator, the longest ever built at the time. During structural renovations in May 1976, a fire burned away the building's transparent acrylic bubble, leaving the steel latticework and interior exposed. In August, 1990, Environment Canada purchased the site for $17.5 million to turn it into an interactive museum. The museum, inaugurated in 1995, is a set of enclosed buildings designed by Éric Gauthier inside the original steel skeleton. The Biosphere offers interactive activities and exhibitions on environmental issues related to water, climate change and the sustainable development of the Great Lakes and Saint Lawrence River ecosystems. ↑ A View On Cities (2007). Biosphere, Montreal. Montréal Attractions. Retrieved on 2007-06-07. ↑ 2.0 2.1 Environment Canada (2006-01-24). A Short History of the Biosphère. The Sphere. Retrieved on 2007-06-07. This page was last modified 12:12, 8 December 2012.